“The Women of Lockerbie” premiered at the University Theatre Friday, with a second showing Saturday followed by a discussion on grief. It teaches audiences to heal through art in this modern Greek tragedy by Deborah Brevoort. The play takes place seven years after the 1988 Pan Am Flight 103 plane explosion, which killed all passengers and crewmembers on board as well as some residents of Lockerbie, Scotland. The plane was traveling from London to New York City, but before it could reach its final destination, a bomb exploded in the plane, causing it to crash in Lockerbie. 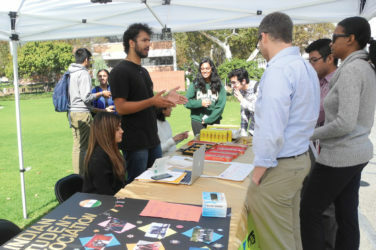 “The best way to grasp the paradox of grief is to notice that we sometimes seek out experiences in life whose emotional content is such that we would avoid them outside of those [conditions]”Our yearning to experience sadness thought art,” said Michael Cholbi, a philosophy professor at Cal Poly Pomona. Eluzai Salmeron Ayala plays Madeline Livingston, a New Jersey mother frantically seeking her son’s remains on the hills of Lockerbie seven years after the plane crash. Unable to find his remains, she distances herself from the people who attempt to help her, like her husband Bill Livingston, played by Gabriel Ortiz. Madeline claims he has not grieved for their dead son, but he assures her that he is hurting as well. However, a group of women from Lockerbie do not lose faith as they encounter the U.S. government in an attempt to obtain the remaining clothing of the victims from the Pan Am Flight 103 so that it can be given back to the victims’ families. The government, however, has planned to burn the clothing because they are contaminated after seven years of being soiled with blood and dirt from the incident, to which the women respond by washing the clothing themselves. At Sunday’s performance, this powerful production brought the audience to tears as the characters of the play found closure through the garments being washed and displayed. 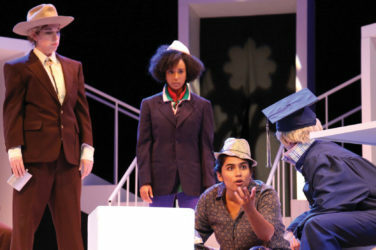 The department previously performed “The Women of Lockerbie” at Cal State San Bernardino to unite students and community members to share the grieving experience a year and a half after the San Bernardino Inland Regional Center shooting in December 2015, which inspired the theatre department to put on this show. Cholbi gave a discussion about the paradox of grieving after the production. The grieving paradox is the desire of gratification of feeling sad or scared through a sad or scary film or play, but not the desire to experience these emotions in daily life. When grieving, one may remember or reestablish values, relationships or goals. The play also touches on love and hate, forgiveness, terrorism and the play gives an insight on the socially constructed gender roles and their role in grieving. “The Women of Lockerbie’s” next shows will take place Thursday through Saturday at 8 p.m. with matinee shows at 10 a.m. on Wednesday and 2 p.m. on Sunday.